Grill Islands Make a Great Outdoor Addition! Has the warm weather of north Georgia got you dreaming of backyard barbecues? Grilling season will soon be upon us. 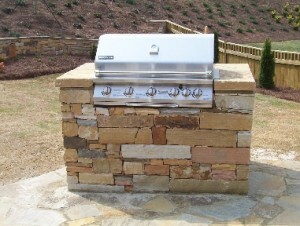 If you are already thinking about grilling that chicken or steak at your Memorial Day Weekend or Fourth of July barbecue celebration, consider the addition of a hardscape grill island. We at Hutcheson Horticultural Company have seen a rising trend in the installation of hardscapes. In particular, we have seen a rise in the installation of grill islands in the greater Metro Atlanta area. While hardscapes, by Google definition, include the nonliving or man-made fixtures of a planned outdoor area, many individuals choose to include an outdoor cooking environment as well. Perhaps you’ve seen the Grill Island episode of Yard Crashers on HGTV and you are not only dreaming of a backyard barbecue, but you are dreaming of installing your own outdoor living space. Maybe you have looked at the pictures of hardscape grill islands on Pinterest. Whatever the case, you know your backyard paradise will not be complete without the installation of a grill island. These are often large projects and often require expert design and installation. We just happen to be experts at designing and installing hardscapes. You can see our gallery of the many amazing hardscape projects we have completed in the past. Contact us today for a consultation on the addition of your backyard paradise. We would love to help you design and install your grill island.